In my ten years of marriage, I’ve learned more about sports than I ever dreamed possible. And I had a lot to learn. Before I met my husband, I actually thought bowl games like the Sugar Bowl, Rose Bowl and Orange Bowl were some sort of super tournament… the winners of which, of course, played in the Superbowl. While I’m definitely still no expert on sports (as my husband can attest), I’ve come a long way since then. ESPN is always on at our house, so I’ve learned a lot by sheer osmosis. And so, my latest project was one which I had lots of fodder for. My latest painting was done for last month’s giveaway winner, Tobin’s mom. 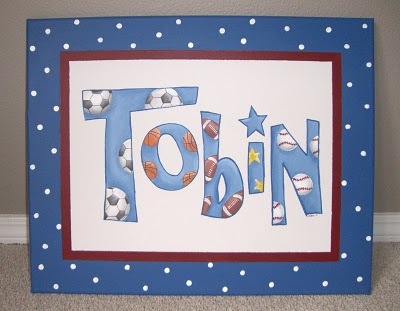 She asked for a sports-themed painting to coordinate with her little guy’s toddler bedding. We designed this painting that featured his name and various sports balls. 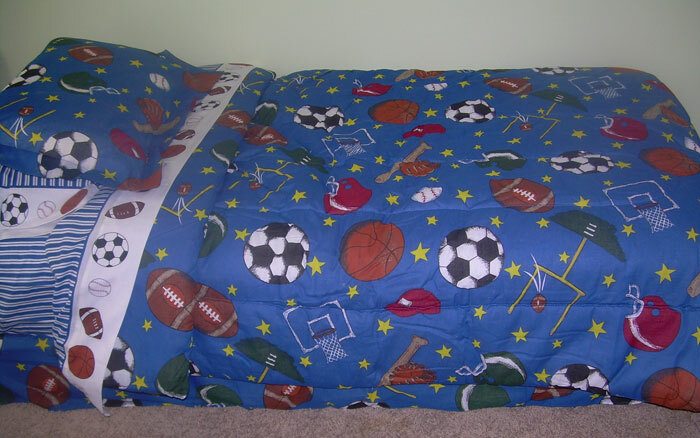 I love the fact that this painting is fun and playful, yet can hopefully transition to an older boy’s bedroom as well. Enjoy, Tobin… may you dream of touchdowns and goals!